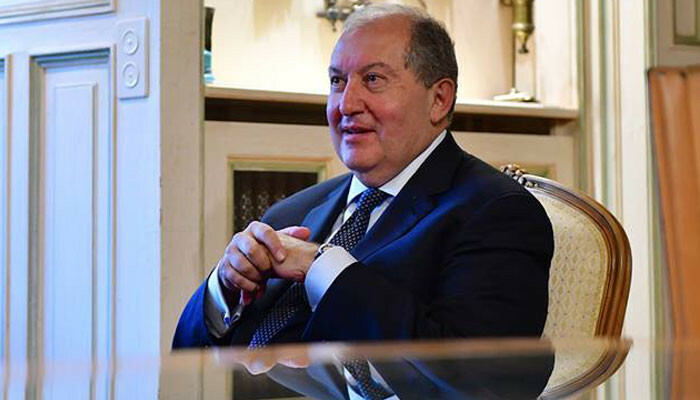 President Armen Sarkissian gave an interview to the Austrian SOCIETY Magazine. You are President of the Republic of Armenia since April 2018, could you tell me a bit about your country? Armenia has always had a dynamic, turbulent and history-charged past, especially concerning culture, art and music but unfortunately also in respect to tragedies. More than 1700 years ago, the Armenians were the first worldwide to become Christians. In 11th century Armenian Bagratid lost their Kingdom in Armenia. Later, the country lost the Armenian Kingdom of Cilicia, the main bastion of the crusaders. Despite this loss, Armenians were always well-organized and a very active nation and the strength and emotions were led by the church and communities surrounding it. At the beginning of the 20th century, Armenia faced the tragedy of the holocaust that was due to the genocide of Armenians by the Ottoman Empire, where millions of compatriots lost their lives. Every family has a story relating to that tragic event. The family of my grandmother lost her first child because of the genocide. This tragic occurrence created a big wave of Armenian diaspora in the world, from the United States to Australia or France. Since then, we gained our independence 100 years ago, but only briefly after the first Republic of Armenia was proclaimed in 1918, it became a part of the Soviet Union. Following the end of the affiliation, problems blew up especially in Nagorno-Karabakh and elsewhere. We hope to resolve that in the 21st Century. Before being President of the Republic of Armenia you already served as a diplomat to Great Britain, so you know diplomacy in all its glory? Diplomacy is a craft and I was lucky enough to meet those who are the great artsmen of it. You could say that I had several lives so far. The first one was marked by my passion for theoretical physics and relativistic astrophysics. Later I became a diplomat, serving in many countries, even in seven countries simultaneously, and then as a senior Ambassador to Europe in London. My third career was my advisory activity for big companies like British Petroleum, helping them to make business in Eurasia. I also had offices in Vienna, as a non-executive advisor for a high-tech company. We created games, mostly presented in China and Korea. Being President is a job and a mission at the same time because it is on the one hand my duty as the President of Armenia, but on the other hand I also really enjoy doing it. What are your main goals as President of the Republic of Armenia? The most important points are to resolve the conflicts and to develop Armenia in general. Our nation has a big chance in the 21st century. Our strength is not natural resources but human resources. We are a small state but a global nation, there are as many Armenians living in Russia as there are living in Armenia itself, for example. In the 21st century, this is an advantage because the globe is getting smaller and life is getting faster. The biggest companies in the world are not the oil or gas companies but rather IT companies like Apple and Google. Armenia has a chance of being part of a so-called virtual silk road – a trade route of technologies and communications. This silk road already exists as the global network of people connected to each other virtually and this is the field where you can expand your influence today. It can become the century of Armenia, if we are using our advantage of being a global and highly educated nation, that is very well integrated in many societies. In addition, we are the only country of our region that has strong relations both with the European Union and the Eurasian Economic Union. In a Parliamentary Republic, the President is not the executive leader of the country but he functions as the head of the country, showing the way, the vision or the strategy for the nation. Only a concept with a specific plan can work in harmony with the tendencies of this world. A President has to recognize what the strengths and weaknesses are and find the country’s place in the world. The world is getting smaller and more interconnected and therefore, the national interest of Armenia lies beyond its borders. Who are your main partners worldwide? Historically we have a good relationship with Russia. Formerly, a part of Armenia was part of the Russian Empire and we were supported by Russia in difficult times. We have also very good connections to our neighbors Iran and Georgia. In general, Armenia should continue having deep and good relations with Russia, deepen the ones with the European Union and with China and it should definitely have very good relations with the United States and other nations. Your country recently had a very big growth-rate – What is the reason for it? There could have been several reasons: Either the government was doing well, the people were working hard, the international conditions were favorable or it was a combination of all of these factors, but I think we could have an even higher growth-rate. Armenia has one of the best banking sections in the whole region and also the best IT section. What do you have in mind for the relations between Austria and Armenia? I am ready to get engaged deeper in our relations. We highly appreciate your stand in the recognition of the Armenian genocide and also the support of the idea that there is no other solution in the Nagorno-Karabakh conflict as a political one. I am looking forward to my future discussions with the Austrian President, the Government and the Prime Minister in order to promote and develop our relations, not only politically but culturally as well. Somehow, I am an Ambassador of Austrian culture as I have been visiting the lake Fuschl and Salzburg for 18 years now, has any other President ever done that? Which was the last book that made a deep impression on you? I read a lot in general, but the book I currently engage with the most is the one I am writing on. It is about how politics work in the 21st century and I name it “Quantum Politics”. In your opinion, what matters most in life? There are some basic things that are important in life – time, for example, is one of these. We all only have a certain amount of time on this planet and there are only a few things that are more precious than this time – like love for the people that are close to you or love for your country. You can sacrifice your time for love. So if you don´t love your job why would you be doing it?